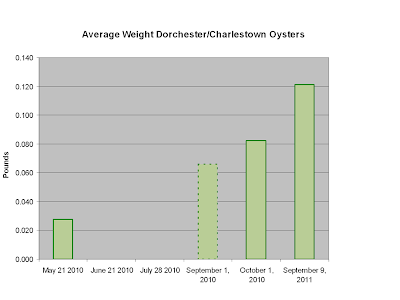 On October first at 1:00-4:00 we will be placing oysters on the bottom at the mouth of the Charles River. This is a great opportunity to participate in an exciting and fun afternoon. Kids will have the opportunity to see numerous creatures that inhabit our harbor including eels, small fish, crabs, and starfish. We will be sorting the oysters and dropping them in a marked location. Please dress warmly as we will be on the water and cool breezes can blow. We will have refreshments, gloves and hats for the volunteers. The oysters can be dirty so you may not want to wear your best clothes. 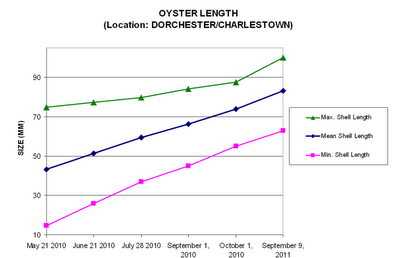 To let us know you are coming please send an email to massoyster@gmail.com. We have finally found a way to post charts to this blog and we thought it would be good to share some information on growth. 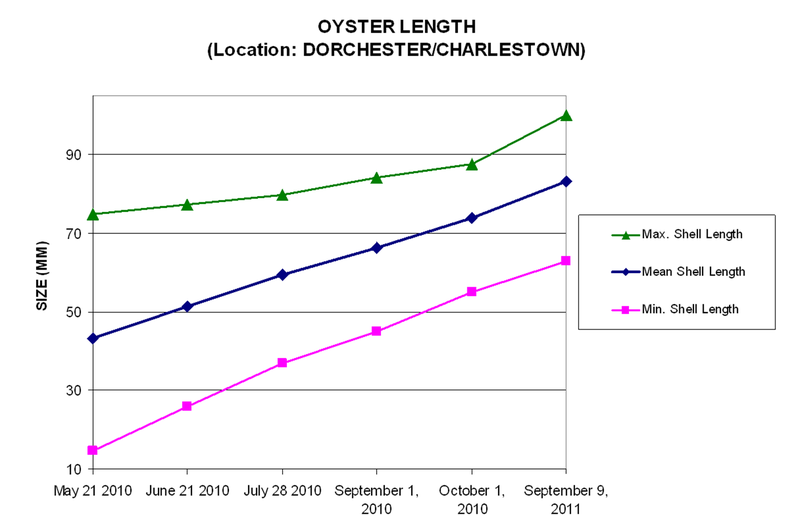 Below are two charts of growth of oysters that were first kept at Dorchester Yacht Club and are now at the mouth of the Charles. This small population is not on the bottom, but suspended in the water column. 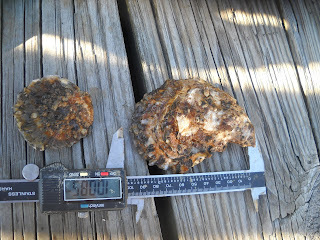 We have seen that oysters on the bottom are slower growing. They also have greater mortality due to predation. 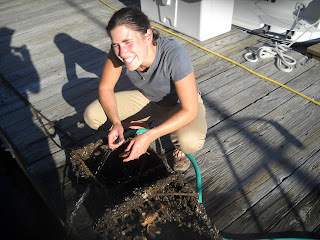 Experienced oyster volunteer Megan Glenn provided valuable expertise. The largest oyster in the cohort measured just over 100 millimeters.The fellow on the left is a European oyster that turned up in our container. They are found throughout the harbor and typically live in deeper water. A landmark report by Restore America's Estuaries (RAE) shows that coasts and estuaries are not only essential to the nation's economy, but that investments in coastal habitat restoration produce jobs in a cash-strapped, job-starved economy at a higher rate than many other sectors, including oil and gas and road-infrastructure. The report, "Jobs & Dollars: Big Returns from Coastal Habitat Restoration," lays out a powerful case for government and private investment in the nation's coasts and estuaries, drawing on national and regional studies of coastal and estuarine restoration projects and setting out its findings in restoration case studies. Coastal habitat restoration--including wetland reconstruction and improvement; rebuilding depleted oyster beds; removal of obsolete dams, culverts, and other obstacles to fish passage; tree planting and floodplain restoration; and invasive species removal--typically create between 20 and 32 jobs for every $1 million invested. In comparison, road infrastructure projects on average create seven jobs per million. Finally, restoration projects generate other returns in the form of new jobs, increased tourism and tourist dollars, hunting and fishing revenues, tax revenues, and property values.